This building started its life in 1848 as the Wesleyan School. Morgan and Gilbert observed in 1969, 'It is a strange composition possibly copied from other works.' It is not heritage listed although it is of historical interest. This was built in 1856 as Sir John Franklin Inn. The verandah and balcony appear to have been added about twenty-five years later. 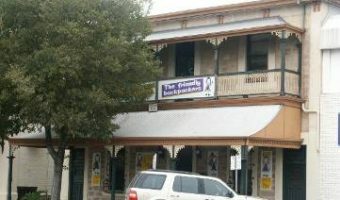 It continues to operate as a hotel more than 150 years later, making it one of the oldest in South Australia.